Deeply rutted into the spine of the United State’s oldest mountain range, the Appalachian Trail draws thousands of would-be thru-hikers every year. Only about one out of four will make the 2,190-mile trip from one end to the other, but don’t let that discourage you. You don’t have to forego civilization for six months in order to enjoy the Appalachian Trail. Like the Appalachians themselves, sections of the trail are beloved and cared for by Americans who have never even attempted the journey from Springer Mountain to Mount Katahdin. Many backpackers, day-hikers, ecologist, geologists, and birdwatchers trace local sections of the trail in search of the history and solace these ancient mountains promise—and there’s no better place to find all that (and more) than on the AT section through Tennessee. From the dense canopies of the Smoky Mountains to the the soaring exposures of the Roan Highlands, Tennessee’s 94-mile section of the AT offers one of the most enriching and diverse hiking experiences in the Southeast. We’ve broken it down into three main sections to help you make the most of it. Note: Always check your intended route ahead of time to make sure there aren’t any trail closures. Rising north from its starting point in Georgia, the AT travels briefly through North Carolina and enters the southern end of the Great Smoky Mountains National Park, where it will curve along near the Tennessee-North Carolina border for the majority of its time in Volunteer State. Tackling the Smokies section of the Appalachian Trail is popular among those with time and tenacity enough to do it, and some even attempt to run the unsanctioned Smokies Challenge Adventure Run (SCAR)—a one-day, 72-mile unsupported run through Great Smoky Mountains National Park. If the entire 72-mile section sounds like a lot, we suggest you at least go after Charlies Bunion, Andrews Bald, and/or Mount Cammerer. 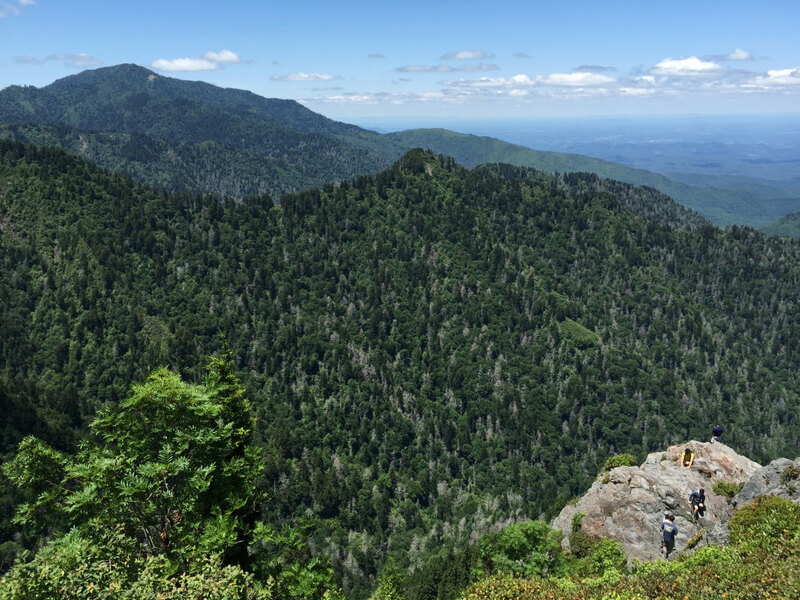 Charlies Bunion is an 8.1-mile hike that some call one of the best sections of the entire Appalachian Trail. Start at Newfound Gap, and then head four miles up the AT to the rocky outcropping. Andrews Bald is a good one if you have young kids with you—the entire walk is less than four miles round trip. 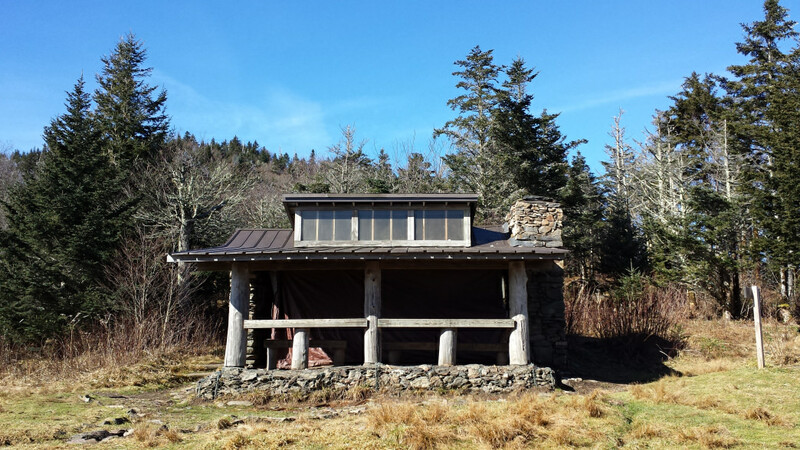 The highest bald on the AT is easy to get to on the Forney Ridge trail from Clingmans Dome, and is a scenic spot for a picnic or just to relax. The 5.5 miles up to Mount Cammerer are stout, but you’ll be rewarded with views of the entire surrounding area and beyond. And don’t forget to climb Clingmans Dome Tower, the highest point on the entire trail. There are multiple ways to get up there, or just drive up to the parking lot and walk to the tower. The Clingmans Dome parking lot is also a good spot to use as a starting point for exploring other sections of the trail. Depending on what your hiking ambitions are, you may need one of two backcountry permits to go through/stay in the park—either a General Backcountry Permit or an AT Thru-Hiker Permit. On the northeast side of the park, the AT exits the Smokies, crosses Interstate 40, and begins a 15 mile climb up to Max Patch: one of the most spectacular views in the southeast. On sunny summer days, you’ll find fellow hikers basking in the warmth of the sun or playing catch with their dogs until tennis balls and frisbies inevitably disappear in the tall grasses. In the colder months, you’ll likely have the bald to yourself, a chance to watch introspectively as a sea of grey clouds roll through the bare valleys below. 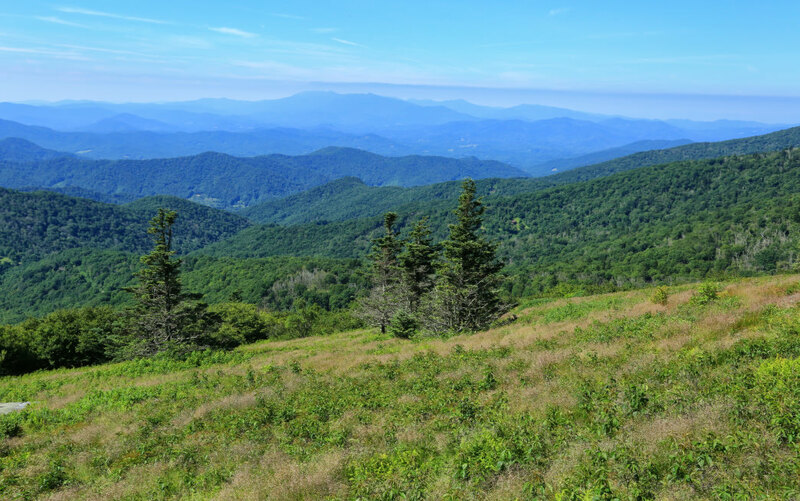 Beyond Max Patch, 100 miles of trail in the Cherokee National Forest climb up to the Roan Highlands in the far northeastern end of the state. This stretch is the least-frequented and least regulated section, with only a few small mountain towns along the way. 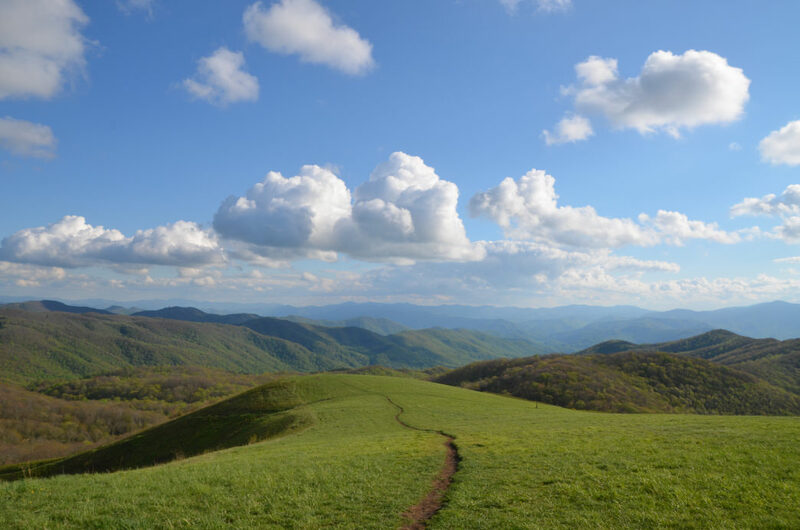 If you’re considering hiking a section here, try the 20 miles from Max Patch to Hot Springs, NC, or any section in the 44-mile stretch between Sam’s Gap and Iron Mountain Gap. There’s also easy access in Erwin to a beautiful day hike on the AT, overlooking the Nolichucky River. As the Appalachian Trail departs from Tennessee on its way north, it’s given a final glorious farewell on the high exposed hills of the Roan Highlands. Visitors flock to the area in mid-June for the Rhododendron Festival, a two-day celebration lauding the largest natural rhododendron garden in the world, found between Roan High Bluff and Roan High Knob in the Highlands. The 15-mile stretch from Carver’s Gap down to Highway 19E is a perfect overnighter, if you have the endurance to tackle some of the steepest AT climbing south of The Whites. You’ll traverse several exposed balds with 360-degree views, pass beneath dense, lush canopies, and have the opportunity to mingle with thru-hikers and weekend warriors at the Overmountain Shelter, more commonly known as "The Barn." Bring your dog, your camera, and plenty of water and cold weather gear. Temperature, wind, and precipitation can change pretty quickly, and water sources aren’t always reliable. The AT finishes it’s journey through Tennessee on Holston Mountain, beyond which are the gurgling waters along the Virginia Creeper Trail and the pony-pounded balds of the Grayson Highlands. But as great as those are, don’t take too long before you return to the Tennessee section of the Appalachian Trail.